The Okavango outlook from Eagle Island Camp is enchanting - especially after good floods when the lagoon comes right up to the doorstep and the whole place has a fairytale quality. It is the kind of place where you want to sit on your wooden balcony and stare into what seems like a make-believe world. Let Carrie Hampton take you there....read on. 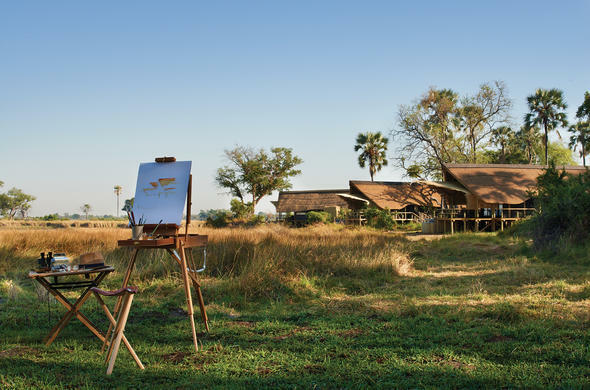 You wouldn't have to sit on your veranda at Eagle Island Camp very long, before hippos popped their head up between water lilies, elephants sauntered by, or a herd of large tan-coloured lechwe antelope came to graze. Lions, leopards and hyenas tend to wait until nightfall when you are asleep, to come strolling through Eagle Island Camp. The bird life at Eagle Island is extraordinary too, with territorial Fish Eagles patrolling their patch of the Okavango Delta, and letting loose their distinctive cry throughout the day. 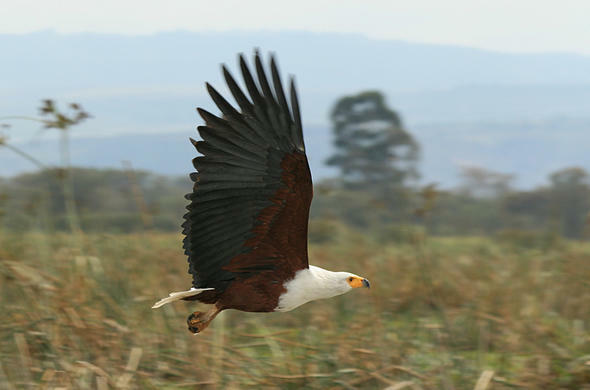 Don't take this for granted, as the cry of the fish eagle it is one of the most inspiring sounds of Africa, which will remain with your forever. Eagle Island Camp is set on an island on Xaxaba Lagoon (meaning 'Island of Tall Trees'), and the leafy canopy shades the camp from the hot African sun. In front of Eagle Island Camp is a large seasonal floodplain, whose waters rise and fall according to floodwaters way up river in Angola. 2004 was a good year for rains and floodwater, so by June, the floodplain and water channels were full and covered in lilies. By August the waters in Xaxaba reach a peak, then start receding again in an age old cycle. The water level determines your activities at Eagle Island Camp and I spent a lovely morning cruising the Okavango waterways on a large flat-bottomed boat, stopping to watch crocs and hippos, herons and elephants. A more silent leisurely form of tranpsort across the Okavango Delta is in a mokoro (traditional canoe), which sits very close to the waterline. It is poled along by your guide who stands at the back of the canoe. His stable rhythmic movements belie just how wobbly this canoe is, and I would last less than a minute before falling in. 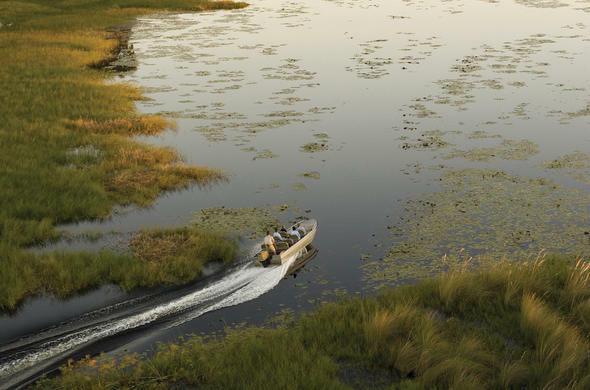 If you come all the way to the Okavango Delta, you must take to a mokoro! You soon relax into it and quickly learn to listen to the sounds of the delta. Game drives are also offered at Eagle Island Camp from November to April, when the African bush surrounding the camp has dried out. The rooms really at Eagle Island Camp are quite delightful. Simple (in a luxurious way), and perfectly at ease in their surroundings. There are 12 tented chalets perched on wooden platforms along the edge of the floodplain, each with a beautiful outlook. The walls may be canvas but inside is as much luxury as you could want. The en-suite bathroom has a flush toilet and huge shower, double sink and plenty of hanging space, plus an electronic safe, which just gives added security for your significant belongings (which is probably not necessary but comforting nevertheless). The bed is huge and the walk-in mosquito net gives it the essence a four poster. Nights can be quite cold during the southern hemisphere winter (June-Aug), so a heater warms up the bedroom nicely, and performs as an air conditioner during the summer. Hot water bottles are an added bonus as you creep into your bed at night. 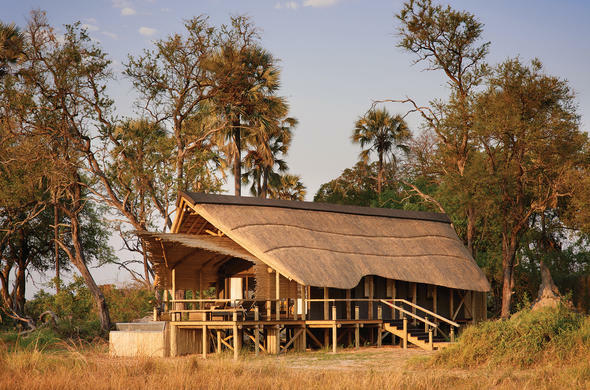 I didn't say overnight at Eagle Island Camp as I was just passing through, so I cannot comment on the food, but all Orient Express safari lodges work from the same daily menu, so that if you visit all of their three Botswana safari lodges, you will never be served the same dish. It is amazing the quality they manage to offer in the middle of the African bush. Add a terrace, swimming pool and discreet bird hide/come lookout lounge, to the general charm and comforts of Eagle Island Camp, and you may just want to stay here longer than your allotted time. There are several safari companies in Botswana, who own a number of safari camps and lodges dotted around the prime destinations. If you book a package where you stay in more than one lodge belonging to the same company, you will get a much better nightly rate than if you chop and change between companies. 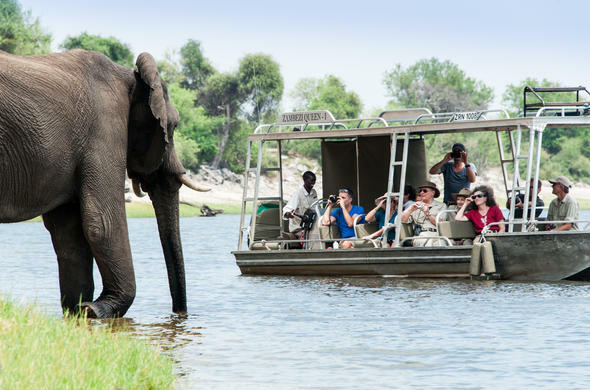 Orient Express Safaris have three safari camps/lodges in Botswana's top safari areas; Eagle Island Camp, Khwai River Lodge and Savute Elephant Camp. They also own the Westcliff in Johannesburg and the Mount Nelson in Cape Town. 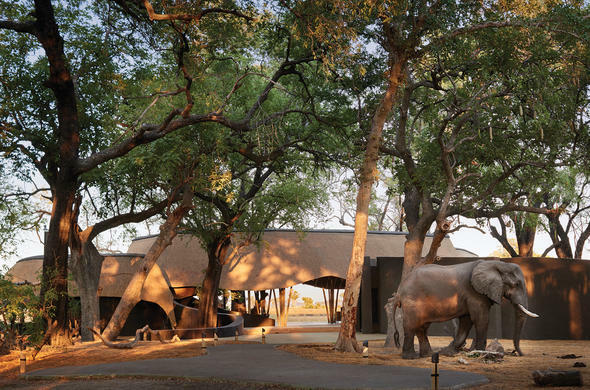 Read my personal reviews of each of these safari lodges and hotels. The Okavango Delta has an interesting anomaly; The floodplains are dry in the rainy season and flooded in the dry season! This is because it is not the local rainwater that fills the plains, it is the floodwater coming from the Angolan highlands, which takes many months to get here. Flood Season: Angolan floodwater starts seeping over the seasonal floodplains from May onwards and between June and September the water reaches a peak. Birding is particularly good in Sept, Oct and November with thousands of migrant birds adding to the existing large bird population. Eagle Island Camp at Xaxaba is a water based camp situated on Chief's Island, in the pristine wilderness of the Central Okavango Delta.